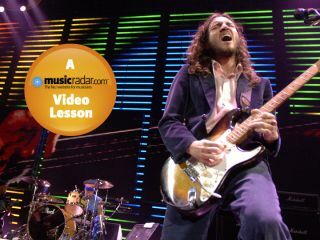 World famous as guitarist with the Red Hot Chili Peppers, John Frusciante is also a prolific solo artist. His angular, funky style comes from influences as diverse as Jimi Hendrix, Johnny Marr and Siouxsie Sioux guitarist John McGeoch, as well as electronica and new wave such as Kraftwerk. Our examples here are inspired primarily by John's most recent work with RHCP. They showcase his clean, precise chord work interspersed with deliberately 'naïve' sounding melodies, contrasting with full-blown Hendrix style lead workouts. John mainly uses old Fender Stratocasters through Marshalls to get his tone. Use a neck pickup with a clean tone and a touch of compression for added smoothness. Elsewhere, a 'Fuzz Face'-type distortion and slapback echo (set to repeat at around 100ms) will prove handy, as will a fantastically solid drummer and mad bass player! This rhythm part is not quite as simple as it may first appear. It uses a couple of different versions of D minor, the highest of which will test your evenness of finger pressure and intonation. This part won't sound good played loosely so keep your timing tight! This is an embellished version of Example 1 and displays John's long acknowledged Hendrix influence. Again, it's deceptively tricky, requiring ultra clean position changes and careful muting of the fifth string until the final bar. This deliberately simple melody calls to mind the synth lines you might come across in the electronic music John has a fondness for. It's not a terribly difficult line to play technically, but remember not to add lots of typical 'guitarisms' like bends and wide vibrato because this defeats the object. Using fuzz/distortion and a slapback echo, this is a great example of John's more fiery side. String bends, gentle vibrato and long slides are all in evidence. This kind of lick could be expanded upon considerably if you know the minor pentatonic scale across the neck.